Licensed practical nurses (LPNs) provide nursing care under the direction of medical practitioners and under the supervision of registered nurses. Operating room technicians, who are also LPNs, are included in this group. LPNs generally practise as team members in health-care facilities such as hospitals, nursing homes, doctor’s offices, clinics, extended care facilities and private residences. LPNs typically work 8- to 12-hour shifts, usually on rotation, including weekends, evenings and holidays. A large amount of time may be spent standing or walking. Long shifts can sometimes cause fatigue, leading to a higher risk of workplace injuries. Workers can be exposed to infectious diseases, radiation and chemicals while working in hospitals and clinics. All nursing staff must follow strict guidelines to prevent infection and injury. Lifting or moving patients may lead to back injuries, although electric beds, ceiling lifts and portable mechanical lifts have significantly reduced the risk of such injuries occurring. Violent behaviour from patients, especially those who are mentally ill, is a potential hazard. LPNs must cope with the emotional aspects of working with the sick, injured and terminally ill, as well as with patients’ families. Licensed practical nurses (LPNs) must complete a recognized college or vocational program specifically for LPNs. Before entering into practice, practical nursing graduates must write and pass the Canadian Practical Nurse Registration Examination and then apply to be registered with the College of Licensed Practical Nursing (CLPN) of British Columbia. For more information on practical nursing regulations, view the CLPN website at www.clpnbc.org. Operating room technicians need either additional academic training in operating room techniques or on-the-job training. Additional education in CPR (cardio-pulmonary resuscitation), immunization certification and leadership are advantageous but not necessary. A growing and aging population will require more health services, which will result in an increased demand for workers in this profession. The majority of job openings expected for LPNs will come from new job creation. The strong demand for LPNs across B.C. tends to be higher in areas with more extended care and long-term care facilities or larger acute care hospitals. Many openings for LPNs will be in specialty areas, such as emergency and pediatric wards, and operating rooms. LPNs who have completed an immunization certification course and the leadership post-certificate course will have better job prospects. The legislated scope of practice for LPNs has not changed in recent years, but their range of capabilities has expanded. New capabilities include mental health, community and pharmacology studies. As well, LPNs are taking on increased responsibilities to provide better patient outcomes and to improve the use of nursing staff. Some LPNs may work as health-care aides before taking the education required for licensed practical nursing. Newly licensed LPNs may find work in a variety of health-care settings such as in doctor’s offices, long-term care facilities, community hospice and large acute care centres. With additional training, LPNs may become operating room technicians. Specialization in areas such as emergency care, pediatrics or community health can be acquired through experience and additional training. LPNs may also complete the Provincial Instructor Diploma and then apply for positions in a college setting that educates both home support/resident care attendants and practical nurses. An LPN may also take supplementary education to become a registered nurse. Self-employment is possible with experience in specialty areas. Examples of nursing services offered by self-employed LPNs include foot care, health consultation, and skin and wound care. With additional experience and education, particularly in leadership, LPNs may move into management roles such as director of care or supervisor of unregulated care providers. Educational bridging programs have now been set up which allow resident care aides to do a shortened practical nursing program and that provide LPNs with a one-year advanced credit for Bachelor of Nursing programs. 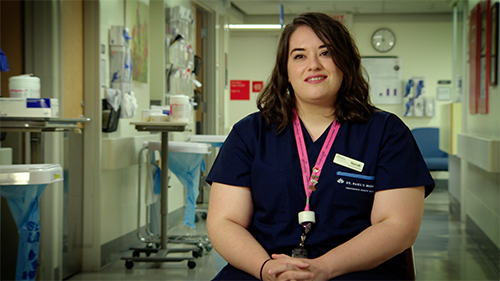 Bridging makes it easier for these health-care workers to gain more education and advance to higher-level positions throughout their careers.